Today the world finally received the iPhone 4S untethered jailbreak thanks to @pod2g and the ‘Dream Team’. GreenPois0n Absinthe was released first by the Chronic Dev Team. 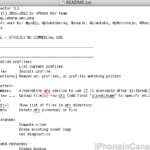 Want to jailbreak your iPhone 4S? 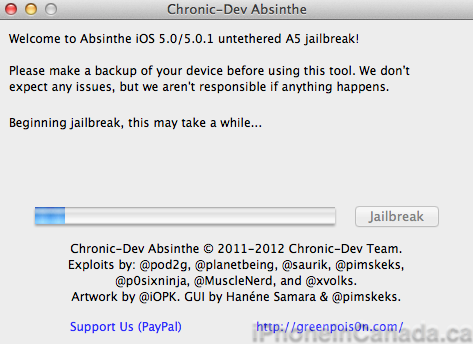 Here’s a quick tutorial on how to jailbreak it with GreenPois0n Absinthe. Warning: Proceed only at your own risk, we are not responsible should anything go wrong with your iPhone 4S! Step 1: Plug in your iPhone 4S to your computer and launch Absinthe. It will detect your iPhone 4S (or iPad 2). Click ‘Jailbreak’. It will definitely take a while so be PATIENT. Just wait, and keep your iPhone 4S plugged into your computer. Step 2: Your iPhone screen will show ‘Restore in Progress’ and jailbreak data will be uploaded to your device. 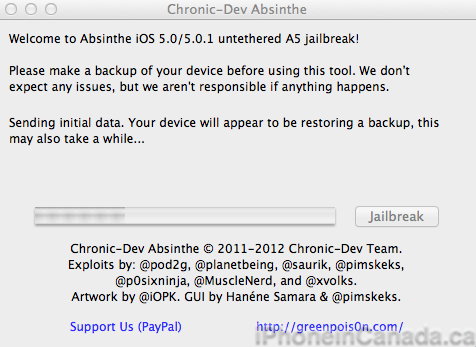 Step 4: Your iPhone will reboot, and the Absinthe icon will be on your Homescreen. It most likely will be on the last page. Launch it and you’ll see a white screen and the jailbreak process will begin. Be patient and do not exit this screen or close the app. Step 4A: If you run into the “Error establishing a database connection”, or if the screen stays white, go to General–>Settings–>Network–VPN–and toggle the jailbreak VPN to ON. An error will occur–just wait–and your iPhone will reboot. Step 5: Your iPhone will reboot, you will now notice the Absinthe icon will be replaced by Cydia. Voila! – Toggle the VPN only after the Absinthe OS X app says it’s done. Let us know how this brief guide works for you. Be patient and persistent!